The best way to make yorkshire pudding batter is to use an even amount of everything. Tip the flour into a bowl and beat in the eggs until smooth. Gradually add the milk and continue to beat until the mix is lump-free. Season with salt and pepper, plus a splash of malt vinegar. Leave the batter to stand for 30mins. Heat the oven to 230C/gas 8. 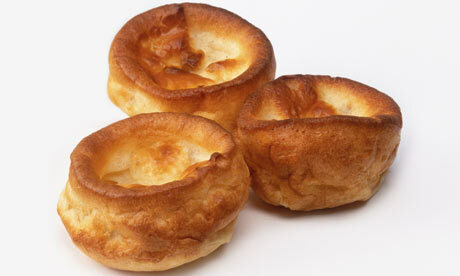 Drizzle oil evenly into Yorkshire pudding or muffin tins and put in the oven to heat through. Pour the batter into a jug, then remove the hot tins from the oven. Carefully pour the batter evenly into the holes. Place the tins back in the oven and leave undisturbed for 20-25 mins until the puddings have puffed up and browned. Serve immediately. Gallery | This entry was posted in Recipes / Food and tagged Roast, Trimmings, Yorkies, Yorkshire Pudding, Yorkshire Puddings, Yorkshires. Bookmark the permalink. This looks fabulous! I have really been wanting to make one of these with a roast! They are very easy once you get the consistency right, hope you enjoy making them.